Friction kit ,Steel kit,Gaskets, seals, o-rings, sealing rings, and commonly replaced bushings required for complete transmission rebuilding. All the parts using high quality material. Oil seals : no deformation ,no leaking ,high-temperature resistance, can be NOK brand as requested. Gaskets :original from Dupon USA, Interface. We are Guangzhou STK transmission parts Co.,Ltd, located in Guangzhou,China. A specialized manufacture of automatic transmisison parts . 1. Our products are mainly manufactured by our own factory ,which we have very strict quality controlling system .So .QUALITY is the last thing you need to concern about here in STK. 2. Some of the material are imported from Janpan ,USA etc. With good quality. 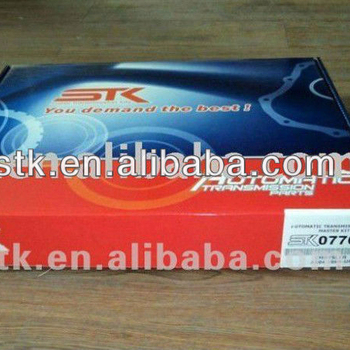 Guangzhou STK Transmission Parts Co., Ltd.